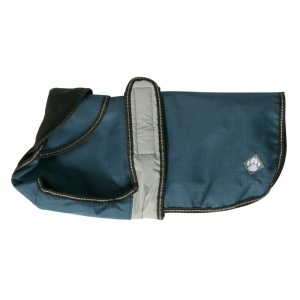 For winter warmth attach the Polar Fleece liner to the coat with the easifit Velcro strips. 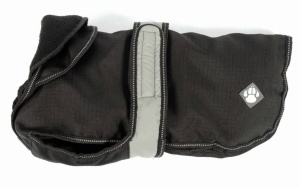 When its warmer, remove the fleece and the coat converts to a lightweight dog raincoat. The 2-in-1 coat also features full chest protection, light reflective beading and light reflective fastening strap for extra safety at night. Rear leg straps are also built in to help prevent side slippage. The outer coat is made from a waterproof, windproof and breathable fabric to protect from the elements and ensures that your dog is comfortable whatever the weather. Available in sizes up to 75cm. Measure your dog from the collar to the base of the tail to determine the required size. 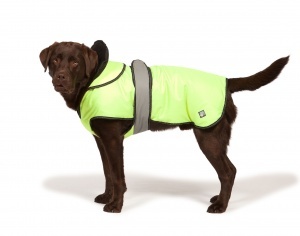 These coats have a generous girth and are suited to robust dogs. This coat is perfect for our large Golden Retriever. I have struggled to find a coat big enough for him. He is quite old now so we wanted to keep him warm and comfortable this winter without limiting his movement. As well as keeping him warm it helps keep him clean and dry too. 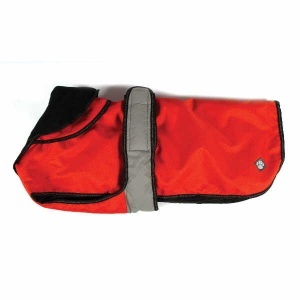 The waterproof coat without the fleece will be ideal for warmer but wet days. The coat was delivered speedily and I am very pleased with the service I have received. I was having so much difficulty getting a coat big enough to fit my large Rhodesian Ridgeback, but thanks to Big Dog World she can now spend winter in a beautiful warm coat. I will definitely buy from them again. Looked everywhere for a waterproof coat for my lovely but slightly large Labrador. The Danish 2 in 1 fits her very well, she looks comfortable and is largely dry when we get back home. Could not ask for more! Will definitely use Big Dog World again!! Excellent coat, excellent service and I paid for next day delivery and it was here the day after ordering! Will definitely use Big Dog World again! !